During the early days of American history nails were so sought after that a house was burned to the ground when it became vacant so that the ashes could be sifted through for every last nail. Nails eventually became more valuable than American currency itself. A similar turn of events led Scotland to also use nails as a form of currency at some point in time. Thomas Jefferson, despite his antislavery facade, used slave children to make nails. Rumor has it that the sale of these made up most of his profits. The reason nails were so costly in the first place was the effort required to make them. So called wrought nails (meaning shaped by hammering) needed to be individually hammered out by blacksmiths. This was standard procedure all the way up to the late 1700s. Necessity and the Industrial Revolution created a mechanical process by which multiple nails could be cut at a speed that put many blacksmiths out of business. By the 1850s, 2 men were able to operate a machine that produced about 3000 nails in just one minute. Necessity later introduced the galvanization of nails. This is a zinc coating that aids in preventing/reducing decay. Nail lengths are a little confusing. Their unit of measurement is called the penny. Oddly enough, penny is abbreviated by a lowercase d. The d comes from the denarius, the Roman equivalent to the modern quarter (USD). History is not sure weather the correlation is due to the coin's weight, size, or what have you. 2d is equal to 1 inch. 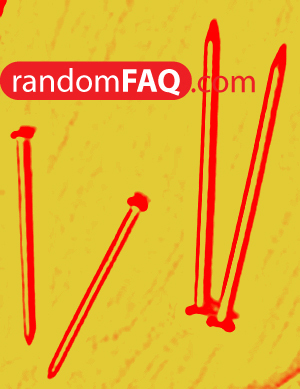 Add another d (3d) and you have a nail an inch and quarter in length. The system further complicates itself once you pass 16d and so on.